1. 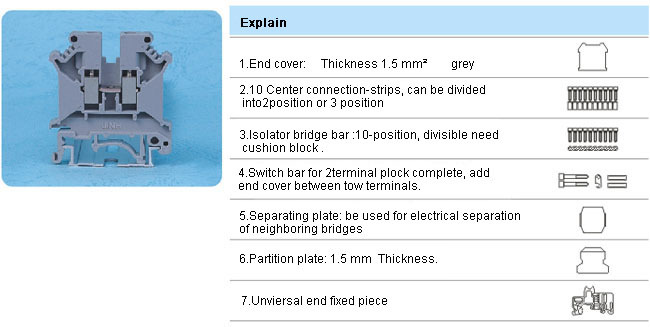 Reasonable installation structure design, wide genera-purpose nature, can be used both G type and TH type guide rail. If it is above50 mm2,adopts fasten accessory installation . 2. Small volume, complete set of specification, big connected conductorsectional area and good electrical conductivity, the one that is below50 mm2adopts copper press line frame and copper fasten screw; and the one that is above 50 mm2 adopts copper press line frame and steel screw and copper skirt plate. It has big tighten moment and self-locking function. 3. 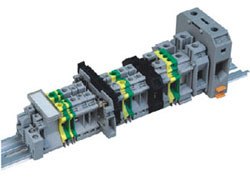 The strong combined function makes the connection of conductor be simpler . Copyright © Zhejiang Huawu Electric Co.,Ltd. All Rights Reserved.